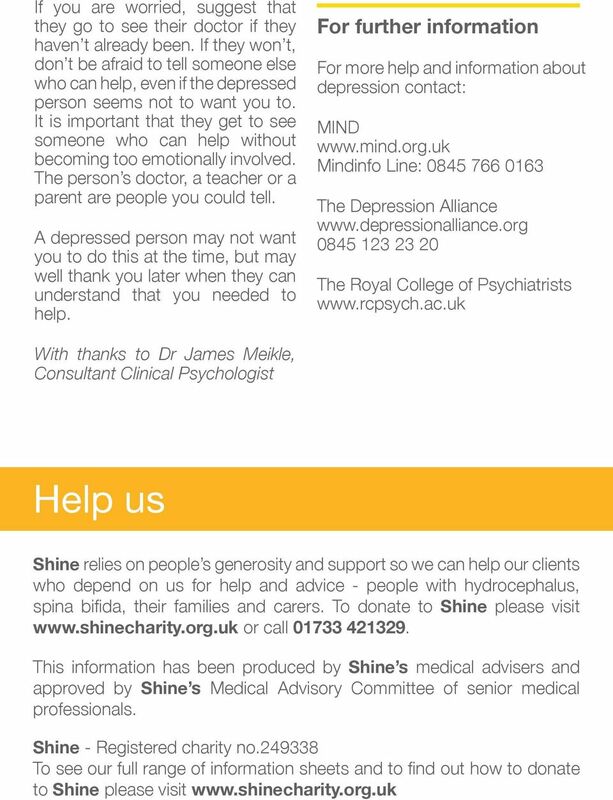 1 shinecharity.org.uk 42 Park Road Peterborough PE1 2UQ Depression and Disability Feelings and Disability Many people with long-term physical difficulties don t like using the word disabled about themselves but it is the word that the government uses to talk about people who have a long-term health problem. If you need to claim Benefits then it may be a Disability Benefit or if an employer or a college treat you unfairly then it will Disability law that is being broken. So we will carry on using this word here. 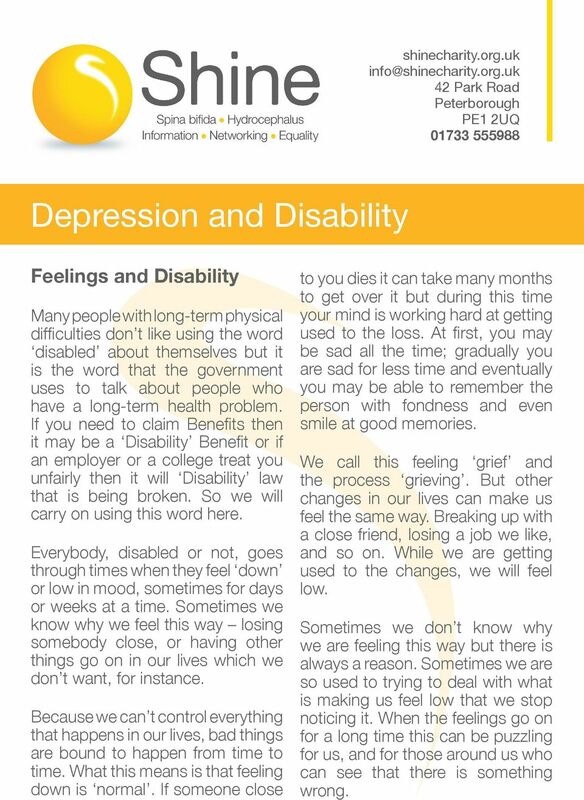 Everybody, disabled or not, goes through times when they feel down or low in mood, sometimes for days or weeks at a time. Sometimes we know why we feel this way losing somebody close, or having other things go on in our lives which we don t want, for instance. Because we can t control everything that happens in our lives, bad things are bound to happen from time to time. What this means is that feeling down is normal. If someone close to you dies it can take many months to get over it but during this time your mind is working hard at getting used to the loss. At first, you may be sad all the time; gradually you are sad for less time and eventually you may be able to remember the person with fondness and even smile at good memories. We call this feeling grief and the process grieving. But other changes in our lives can make us feel the same way. Breaking up with a close friend, losing a job we like, and so on. While we are getting used to the changes, we will feel low. Sometimes we don t know why we are feeling this way but there is always a reason. Sometimes we are so used to trying to deal with what is making us feel low that we stop noticing it. When the feelings go on for a long time this can be puzzling for us, and for those around us who can see that there is something wrong. 2 Depression and Disability Living with any type of disability is difficult. It can often seem that other people around you get what they want more easily. It may seem to you that there are things you would like to do that you will never be able to. Other people are not always kind if they know you are disabled. But because disabled people have to cope with these things every day, they sometimes stop realising how hard it is, begin to feel very down and sometimes don t know why. If you get down sometimes, try to think how someone who is not disabled would feel if they suddenly became disabled and had to cope with all the problems you have to cope with all the time. You are probably doing very well to cope with all your problems. Actually, a lot of people who become disabled, as a result of accidents for instance, do find it very hard to cope and get very down before they learn how to cope. 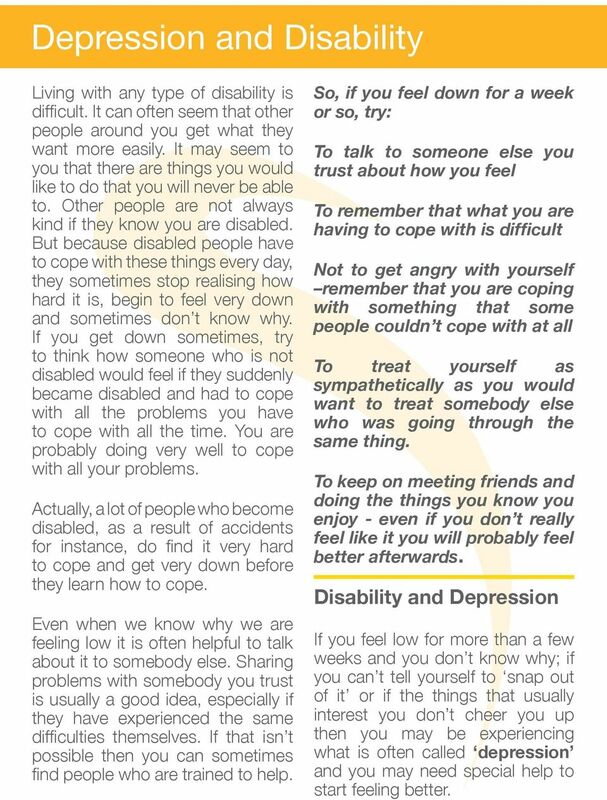 Even when we know why we are feeling low it is often helpful to talk about it to somebody else. Sharing problems with somebody you trust is usually a good idea, especially if they have experienced the same difficulties themselves. If that isn t possible then you can sometimes find people who are trained to help. So, if you feel down for a week or so, try: To talk to someone else you trust about how you feel To remember that what you are having to cope with is difficult Not to get angry with yourself remember that you are coping with something that some people couldn t cope with at all To treat yourself as sympathetically as you would want to treat somebody else who was going through the same thing. To keep on meeting friends and doing the things you know you enjoy - even if you don t really feel like it you will probably feel better afterwards. 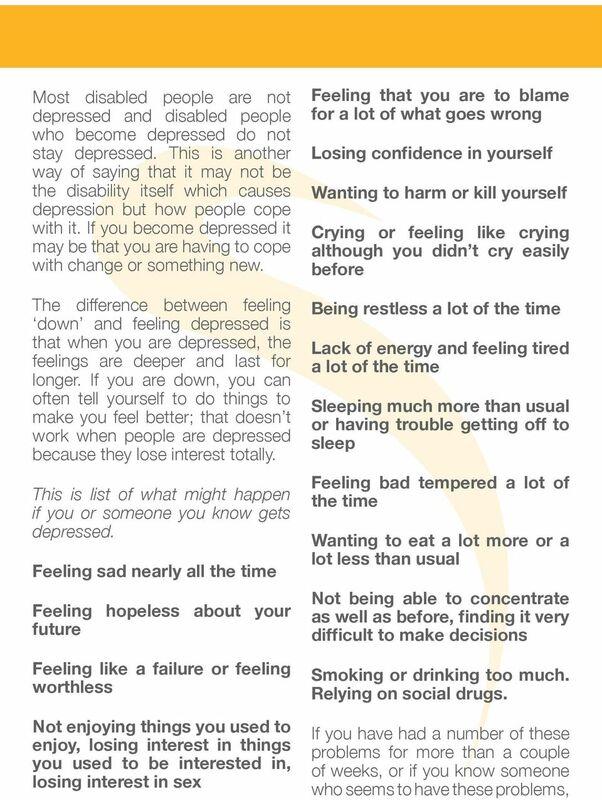 Disability and Depression If you feel low for more than a few weeks and you don t know why; if you can t tell yourself to snap out of it or if the things that usually interest you don t cheer you up then you may be experiencing what is often called depression and you may need special help to start feeling better. 5 for you. Doctors prefer depressed patients to keep taking them for 6 months. Anti-depressants can make you feel peculiar or a bit poorly when you first start taking them but most people manage to cope. If you get severe problems you should tell your doctor. Do not increase or reduce the amount you take without discussing it with your doctor. Drinking alcohol or taking other drugs while you are taking anti-depressants can be dangerous again, discuss this with your doctor. When you feel the time has come to stop taking antidepressants, discuss this with your doctor. You will usually need to reduce the amount you take gradually. How to help other people who become depressed. People who become badly depressed can lose interest in helping themselves and they may have started to shut themselves away from other people. It may seem to you that they are not interested in being with you. Underneath the depression though, there is usually a strong need to be close to others. If they don t seem interested in seeing you, try to show that you still want to see them. Listen to them if they want to talk about problems. 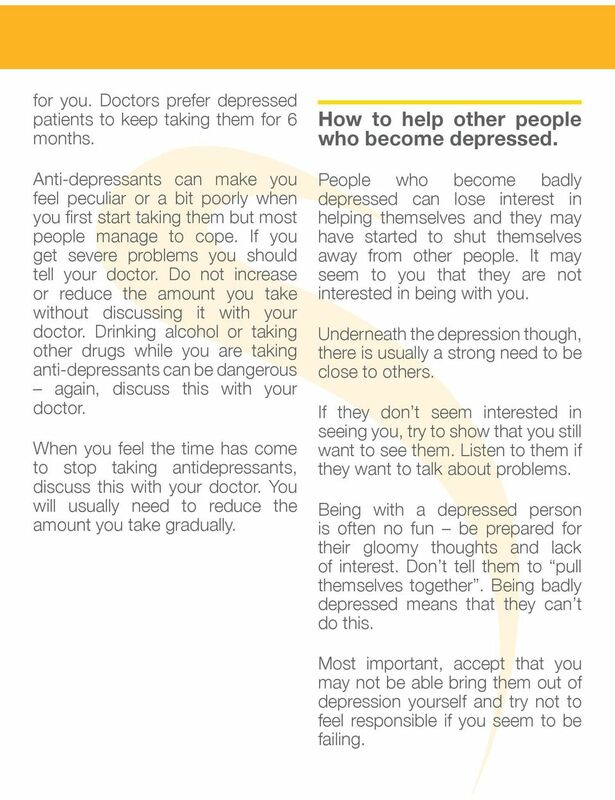 Being with a depressed person is often no fun be prepared for their gloomy thoughts and lack of interest. Don t tell them to pull themselves together. Being badly depressed means that they can t do this. Most important, accept that you may not be able bring them out of depression yourself and try not to feel responsible if you seem to be failing. How can I help my children with their grief? 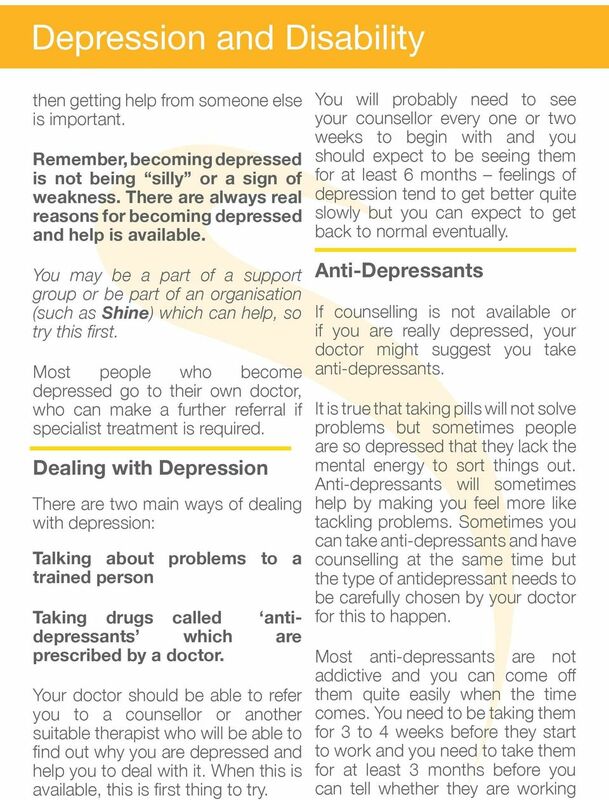 FACT SHEET 4: Mental Health 1 WHAT IS MENTAL HEALTH? Mental health is the health of our emotions and thinking. It is as important as our physical health. Our mental health effects how we see the world. Depression. Amanda s story Part 1. What is depression?